24° Partly cloudy. Isolated showers. Debutant Shane Kersten kicks a goal with his first kick in the AFL. FULL TIMEThe Suns with a historic 40 point win over the Cats. 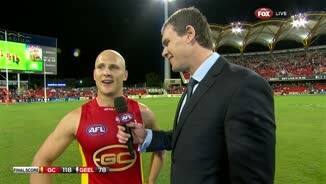 Geelong looked a little off their game and were down two players in their rotation but take nothing away from the Suns. 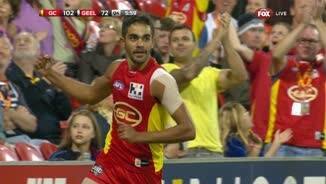 BEHIND SUNSBennell pulls down a one handed mark and then goes back to try and kick a club record seven, as the chant rings around the ground he lets rip and pushes it across for a point. BEHIND SUNSShaw tries to join in the procession but his kick off the ground, clatters into the post for a point. GOAL SUNSBennell isn't going to let Ablett steal his thunder, he comes off the bench strolls across the wing, receives the ball and from 50 out sinks his sixth! GOAL SUNSThe kick in finds, you guessed it the 'prodigal son', Ablett who takes the easiest mark, he then slots home the goal and this one is done! BEHIND SUNSRivers and Dixon wrestle in the goal square, Rivers wins the tussle by thumping the ball through for a rushed behind. BEHIND SUNSMartin show Varcoe a clean pair of heels and then leaps into the air to pull down a nice chest mark, his set shot from 48 out is off line, one point. GOAL CATSMotlop with a goal gives the Cats a sniff, he kicked that ball quickly knowing time was of the essence can they mount a comeback and break Gold Coast hearts? GOAL SUNSA long ball into the Suns, vacant forward fifty, Martin has his jumper pulled by Enright but still has the wheels, he puts the jets on and blows past him to kick his first AFL goal. Selwood with a snap from the boundary line, he tries to kick a team lifting goal but it is right across the face and out of play for a throw in. GOAL CATSHawkins takes the mark and wins the free as May is all over him, he hurries back to the mark and slots home a much needed goal for the Cats, it's the Suns by 30. Cats InterchangeAllen Christensen off due to an injury. 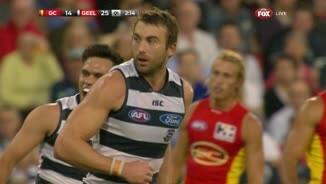 Cats InterchangeHamish McIntosh off due to an injury. Suns InterchangeJaeger O'Meara off due to a concussion. 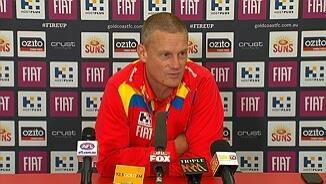 Suns InterchangeGary Ablett off due to an injury. 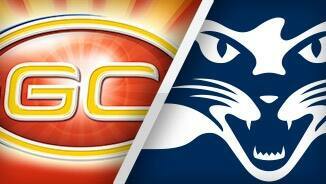 Welcome to Metricon Stadium for the Gold Coast Suns v Geelong Cats Round 14 clash. GARY Ablett's Gold Coast beat his former side Geelong for the first time on Saturday evening, as Harley Bennell's six goals led the Suns to a 40-point win at Metricon Stadium. Gold Coast overcame an early deficit to run over the Cats, with eight unanswered goals either side of three-quarter time setting up a 17.16 (118) to 11.12 (78) triumph, in front of 18,236 fans. The victory lifts the Suns to seventh on the ladder, while the Cats lose pace with the top three. "We got to play a finals-type side tonight and we got a result, which was fantastic," McKenna said. "I'm sure the boys will come away from this weekend saying, "hey we just knocked over a modern-day powerhouse of a football club", so we get some confidence out of that and take that into another powerhouse next week, and after that, there's another powerhouse (Collingwood) waiting for us. "You'd much prefer going into those games on the back of wins rather than losses." 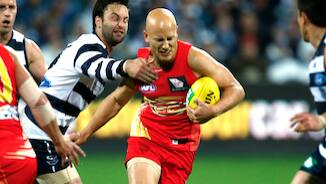 This was Ablett's fifth match against the Cats since heading north from Simonds Stadium at the end of the 2010 season. 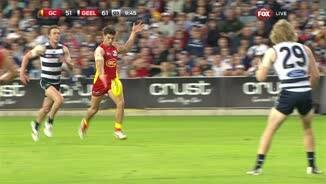 Despite being his usual ball-magnet self with 33 touches and a late goal, Ablett was overshadowed by Bennell who probably played the best game of his short career. Bennell was dogged by a hamstring injury in 2013 and a calf injury earlier this season, but looks set to fulfil the promise he showed in his breakout 2012 season. As well as kicking a game-high six goals, he set up three other majors, including two of Charlie Dixon's three scores, and created countless other opportunities. The result did not seem likely after a five-goal first quarter left the Cats 11 points in front, but they managed just six more for the rest of the game. Almost as worrying for Geelong will be the ankle injury to Mathew Stokes who was forced off at the end of the first quarter. One plus for the Cats was Shane Kersten who bagged three goals on his debut, one of which came from his first kick. 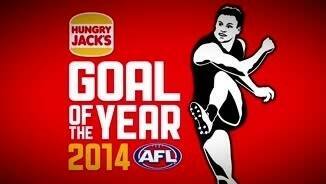 Tom Hawkins and Steven Motlop also kicked three majors. 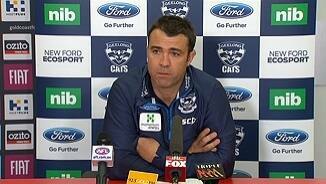 Geelong coach Chris Scott said Kersten would get more chances. "It was a really positive debut for him," Scott said. "We never went into this game thinking he had to prove himself in this game. "He's going to get a good run at it I would have thought if he keeps applying himself the way he has." 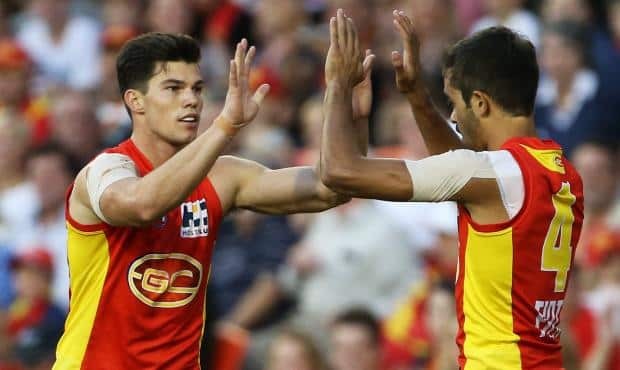 The Suns' teenager Jack Martin, playing in only his second game after injuring his shoulder early on debut in the season opener against Richmond, showed why he is so highly touted in a 15-possession game, which also included seven tackles and a goal.